Discussion in 'Sim Racing Hardware' started by GTPNewsWire, Nov 16, 2017. This article was published by Kyle Patrick (@SlipZtrEm) on November 16th, 2017 in the Hardware category. Squanto, ColinMcN, kalakanto and 5 others like this. Next level Racing GTUltimate V2 or F1/GT (which have their flaws but price wise can not be beaten but still ugly as hell at least to me). 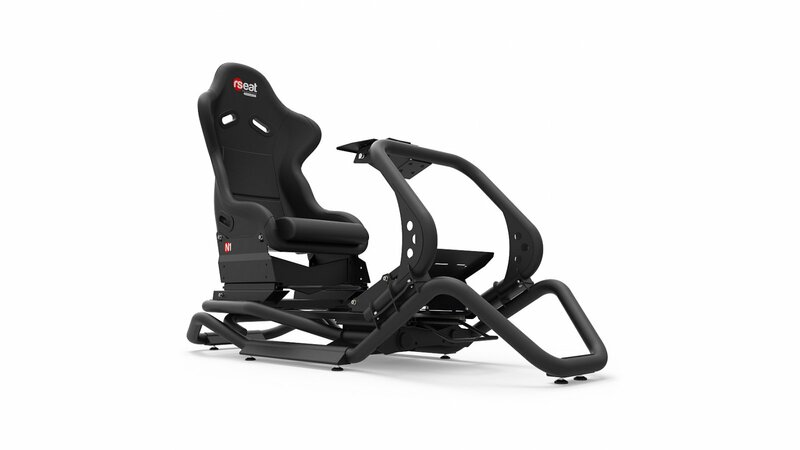 So RSeat N1 is the almost perfect racing cockpit on the market today but it is a definite thing that their next product will be the perfect one after gathering customers’ feedback over years so i decided to play the waiting game for now. Anyways, you have definitely made the best choice in choosing Rseat N1 (I believe that the price is about right but it would be nice to include a better seat). Thanks to update the review down the line and give long term feedback especially on the seat after long sessions. Love my Rseat RS GTR v2, much better than a Playseat. The Rseat doesn't have a post between your legs, the pedals and steering wheel adjust separately. I bought an Rseat in 2013 and never looked back. Old picture here but this is what I use. I have since tidied up the wires with black zip ties and such. If you Google search Rseat RS GTR v2 image, this is one that comes up. Lol I uploaded it to Blu-ray.com a long time ago. Nice looking chassis, I was awarded a “Human Racing” chassis and though it’s beautiful (and rediculously expensive if I’d had to pay for it) it feels a bit flexy and the seat is really hard (I know I can swap out any seat but it’s the wheel base that feels flexy). I have somewhat of an interest in a full upgrade and this one looks perfect. The reality is these things (for better or worse) last forever. So spending a bit more sorta cancels out over the years. Heck, I have an old GT4 edition Playseat waisting away in the side yard and another Playseat I gave away... but in reality both are still perfectly good for 90% of anyone... is this the point in a hobby you just dump money for tiny improvements? I couldn't be happier with my N1. I Bought it last fall after finally giving up on the movement of my Renn wheel stand and deciding I only wanted to make one more purchase (maybe ever) for a rig and I knew that building a rig was something I just wasn't going to do, although I really love the homemade sim rigs I've seen. Long story short, Shaun Cole's review of this last year on the Simpit was so thorough it assuaged any concerns i had over spending such an amount for a rig as I knew it would check all the boxes and would last awhile. However, it was you guys here that also gave me some tips and tricks on ordering, including getting an extended deck for lengthing the foot pedals a few inches (sorry Jerome, I know that could have helped you) and also using M6 casters for moving this monster of a rig around from our storage room to our low profile carpet in our main basement area. That is something my wife really appreciates! I don't know how else to say it, so I'll just say what I'm thinking: when I get into my N1 it feels like home to me. omar awan, Squanto and Lawndart like this. I have a similar one and love it. omar awan, GTP_Remo and potvinsuks like this. However, it was you guys here that also gave me some tips and tricks on ordering, including getting an extended deck for lengthing the foot pedals a few inches (sorry Jerome, I know that could have helped you) . That's okay, I'm happy with how it turned out Like you, I was hoping to buy my last rig. Well....now I know how I am going to spend $1350!! Looks like it would be a great investment for an extremely long time (like 10+ years) use...assuming they keep making parts for it to upgrade as new racing wheels comes out. Please forgive, Jerome, as in my original post I forgot to mention that I thought it was a great review. Nice job. It is the only other one besides Shaun's that I've seen and not that I needed the reassurance...but it was reassuring! Not a RS seat but in the similar ball park. Jump_Ace and BuckFly like this. Holy makerol, you’re not kidding. I love the Vesaro and it’s as serious as a heart attack. Even though I have my rig I was on their website looking at them for fun on Friday. I believe Simracinggirl has the same cockpit, very nice! omar awan and BuckFly like this. Jerome, simracinggirl seems to have a lot of nice stuff lately! However, good to her. If company's are forwarding her this stuff she's at least consistent with doing tests and comparisons and putting that out there. I really wish they would also send all this stuff to about those 5-10 people online who are really good at doing reviews. Btw, Jerome, what a pleasure it was seeing you using those same CSR Elite pedals I have been rocking now for awhile! They are killer pedals for sure. I have a backup set in the garage. But I also treated myself to the new CSL Elite pedals. So after I get 21 more wins in sport mode, I'll try them out. For around that price you can get 80/20 rig like Sim-lab P1 with triple monitor stand and accessories. Only drawback I see is a longer assembly time. As a former Rseat RS1 owner I can say that 80/20 rig is miles better. Exactly. P1 comes in black now too.